I imagine just about every household back in the 1950’s and before had their collection of old bits of string, saved in a ball for future use. I know we always did. Things weren’t wasted around our house, hardly ever. The folks made it through the Great Depression, but we pretty much stayed poor. It’s hard for anyone who has lived in this period of relative plenty to even begin to appreciate what things were like, back before the second half of the 20th century. I know absolutely that the past half century was the best period in human history, at least for those of us fortunate enough to have been born in countries with the power to amass riches and hang on to it. Today, even the poorest of Americans has a standard of living greater than many of their forebears back in pre- and early post-war days. World War II brought us out of the depression, but most farmers and other country folks took a good deal longer to find a place on the prosperity train. We were farm folks. Although there were power lines that ran through our property, we didn’t get electricity on the farm until I was about to enter the first grade or maybe even the second, around 1950. My mother made most of her own clothes, many of them out of material salvaged from flour sacks. Manufacturers made their products attractive in different ways back then. For one thing, they were designed to be useful, not throwaway. People who made their living hand to mouth and weren’t exposed to the propaganda of television advertising looked for maximum value in their purchases, and the ladies chose flour brands quite as much for the patterns and color of the material in the sacks as for the contents. Mom always had a ball of string, in either a kitchen drawer, a drawer of her old pedal-operated sewing machine, or both. The twine mostly came from the closures of the various sacks, which were sewn in such a way that they could be opened by pulling on the end of the string and unraveling it in one long piece. Other things that came in bags, such as fertilizer, were closed in the same way, so there was usually a pretty steady supply of twine to add to the ball, mostly white, but sometimes other colors that kept the ball of string interesting. String was far more important in those days. It’s probably possible for a kid to grow to adulthood today without learning to tie anything but her sneakers, but before the days of ubiquitous plastic tape and other modern implements of security, we tied things. Twine held packages closed, pulled loose teeth, held together and provided guidance for kites, strung our toy bows, and held feathers on the arrows. It fastened the rubber strips from old tire inner tubes onto our slingshots (catapults, to my British readers) and provided amusement for a series of kittens. 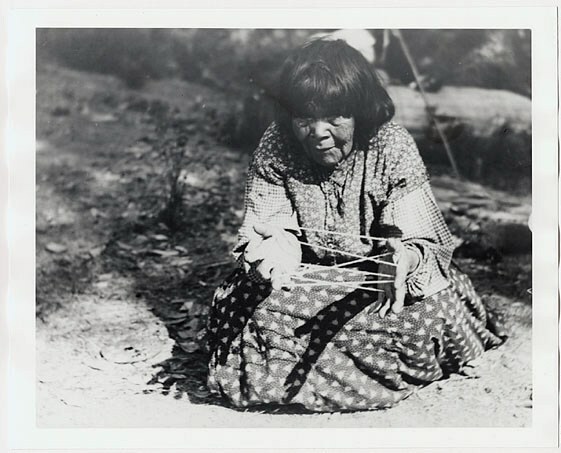 Kids strung it around their fingers in intricate games of cat’s cradle, Jacob’s ladder, and a variety of others — mostly limited by imagination — that probably date back to the first hunter-gatherer who twisted together some strips of bark fiber. It was part and parcel — as well as part of the parcels — of our lives. 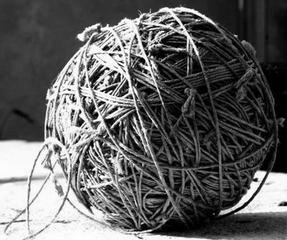 My mom kept a ball of twine for many years after she had an adequate supply of life’s necessities. Like other old habits she hung on to, I think it gave her a feeling of security. I never kept one myself (although I’m sure my older sister does). but I still find it hard to toss a piece of string. Just doesn’t seem right, somehow. This entry was posted in Family, Living, Nostalgia, Seniors and tagged Great Depression, Reminiscence, Twine on July 31, 2013 by Bill.